As we head into the throes of winter, roof damage caused by ice and snow can be a common occurrence. Because of the culmination of stresses on the roof with additional snow weight and ice accumulation, you may experience significant issues. What specifically causes the problems? Can you prevent winter roof damage? Read on to learn the answers to those and other questions. What Causes Winter Roof Damage? The number one cause of winter roof damage is snow or ice that melts too quickly, then refreezes directly after. One reason is excessive heat escaping from the interior of the house. Another source could be backed up gutters that freeze and refreeze repeatedly. All of these conditions are perfect for destructive ice dams. Should I Remove Excess Snow From My Roof? The best advice we can offer here is to monitor the accumulating snow on your roof carefully. If your roof is structurally sound, on average, it should be able to hold about 20 pounds of pressure per square foot. It may not depend on inches though, because wet snow weighs more than powdery snow. Another concern could be back to back storms. If you suspect your roof is entering the danger zone, NEVER get out a ladder and climb onto your roof. 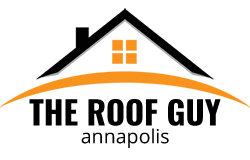 Contact a roofing professional. Also, never toss rock salt or ice melting compounds on your roof. Additionally, the runoff will damage your lawn, and the chemical will ruin your shingles. What if My Gutters Are Frozen? Ice in gutters and downspouts is virtually impossible to remove without causing roof damage or harming the actual gutters. However, frozen gutters are a repair waiting to happen. At minimum always take care of fall maintenance and clear your gutters. Should you experience an extreme case of frozen gutters, a professional may recommend removing the system to prevent damage. Will My Flat Roof Have More Issues? It is imperative that you have adequate drainage for your flat roof. Unfortunately, when drains freeze water gets trapped on the roof. If the trapped water accumulates to levels higher than the roof flashing, you will experience problematic leaks. An emergency solution may involve removing the downspout and physically opening the drain to create discharge. If you want to prevent winter roof damage regular maintenance for flat roofs is a must. How Can I Prevent Winter Roof Damage? Keep the Attic Cold — The proper amount of insulation in your attic is essential during the winter months. There should be adequate protection so that just enough heat escapes, allowing the snow to melt slowly and safely. If snow and ice melt to quickly it could form damaging ice dams, clog up gutters, and cause dangerous icicles along your eaves. Heavy Snow Removal — Remember this is only necessary in extreme cases of heavy snowfall or after back to back storms where there is a massive accumulation. And, it is best left up to the professionals. Clear the Gutters — As part of your storm preparations consider checking your gutters and downspouts before the snow begins to fall. If water backs up and freezes solid, you could do more damage addressing the situation yourself. Contact a professional for assistance. 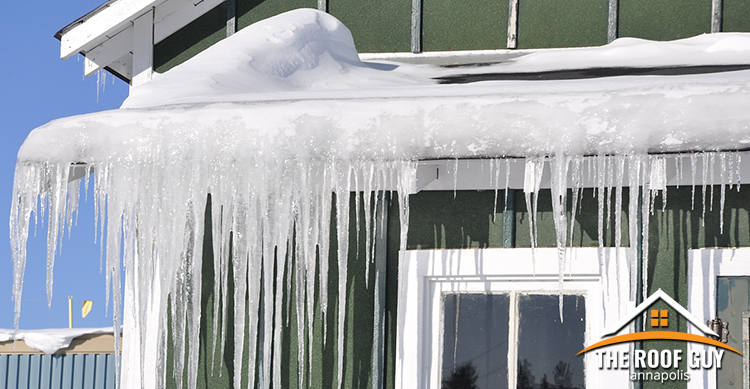 Leave the Icicles — Resist the temptation to know off the icicles around your roof edges. For starters, it is dangerous, and it could easily damage your eaves, flashings, and gutters. Therefore leaving your roof in even worse condition and vulnerable for the rest of the winter. Should you encounter any winter roofing issues, prevent further damage and call a roofing professional, the Roof Guy of Annapolis. Your roof is your home’s first line of defense against harsh weather, so don’t take any chances. Contact us today for a free evaluation.